Zecharia Sitchin has written 6 books as part of his ‘Earth Chronicles’ series detailing his theories about humanity’s origins and the hidden planet ‘Nibiru’, plus several complimentary tomes. His theories are based upon his scholarly study of ancient Sumerian and Akkadian tablets, and the remarkably frank accounts therein of the ancient gods, or Anunnaki. According to Sitchin, the ancient accounts testify to an underlying reality that challenges our established notions of our origins to the core. His scholarly contribution to the so-called ‘ancient astronaut’ mode of thought is unparalleled. This latest book ‘The Lost Book of Enki’ compliments the ‘Earth Chronicles’, but it bears little resemblance to his other alternative science books. Within its pages Sitchin gives us his complete vision of our past. ‘The Lost Book of Enki’ is a work of literature, written in the style of an Akkadian epic poem, and provides us with Sitchin’s version of the original ‘sourcebook’ for the Mesopotamian/Egyptian mythologies. He has set the book out in the form of 14 tablets, written out by the master Akkadian scribe Endubsar. In the text, Endubsar claims that the tablets were dictated to him by the god Enki himself. The impression is given that the reader has in front of him actual historical material, and it’s easy to see why many readers have taken this book at face value. But this book is in reality an historical novel, incorporating Sitchin’s world-view. The first thing one notices upon picking up this hardback book is that Sitchin has a different publisher. Perhaps Avon will print 'The Lost Book of Enki' in paperback, perhaps not. This book breaks an awful lot of unwritten rules in alternative science, by amalgamating scholarly research with fiction. Potentially this is a dangerous book for Sitchin, because it opens him up to charges of making the whole thing up, simply because he has started to fill in the mythological gaps with his own account. Worse still, it is by no means clear what parts of the book have been directly derived from the ancient texts, and which have been essentially dreamt up by Sitchin. For his part, he openly offers this book as a possible blueprint for the original source-book upon which all Mesopotamian mythology was once based. It stands as a literary work, rather than a theoretical study. He has brought together many stories, from epics and fragments alike, and made a cohesive whole from them based upon his theory about extra-terrestrial gods. The sheer scale of his vision is breathtaking. Perhaps Sitchin felt that he needed to give this vision an appropriate form in one book, his Magnum Opus. But I suspect he is taking a big risk, and I don’t think it’s going to pay off. His regular readers will already be familiar with 90% of the material in the book, and newcomers won’t know what to make of it…it contains no word of explanation for the Sitchin novice. The other problem is the writing style Sitchin uses. It is written in the style of ancient Mesopotamian prose, giving one the feeling that this is the real thing; lost epics that explain everything. Like I said, this is a dangerous game Sitchin is playing by moving from a science-based approach to a literary one. I remember struggling with Latin at school, with its subject-object-verb format and lack of definite articles. This ancient prose of Sitchin’s isn’t quite so daunting, but the format takes a bit of getting used to. Occasionally, a modern word will creep in to the text (like ‘diaper’ for instance, which is American, and hardly ‘ancient’), reminding the reader that this is a semi-fictional work after all. There has been much speculation that Zecharia Sitchin believes that Nibiru is set to return in the near future. ‘The Lost Book of Enki’ quashes this rumour once and for all. Nibiru appears at the beginning of the Nippur calendar in the book, which he has previously denoted as 3760BC, and is celebrated by the Anunnaki as the Nibiruan New Year. According to Sitchin’s timeline, then, Nibiru would have again appeared in 160BC, and is due to appear next in 3440AD, or so. Unfortunately, the chronology of ‘The Lost Book of Enki’ ends with the destruction of the Akkadian society by the unleashing of Anunnaki weapons of mass destruction (an event recently linked to a meteor impact in Iraq around 2300BC [The Sunday Telegraph 4/11/01]). It does not seek to explain Nibiru’s subsequent historical appearance. Even so, Sitchin appears unequivocal…Nibiru will not be returning during any of our lifetimes. Another new detail of interest is the appearance of Nibiru in the constellation of Leo during the perihelion transit that brought about the Flood (described in some detail in this new book). If this is what he meant (and he could possibly have alluded to the Age of Leo), I’m gratified that The Lion is now included on the list of constellations that Nibiru can be visibly seen against during perihelion. The adjacent constellation of Cancer appears to be the first point when Nibiru crosses the ecliptic (Taurus marks the second), and a parallax effect could easily place Nibiru in Leo as it first brightens from the void. I have found fascinating evidence from around the time of Christ that Nibiru indeed appeared in Leo (see DarkStar16). Other aspects of this book indicate to me that Sitchin does not really have a proper understanding of planetary science, which is worrying. For instance, his portrayal of the 'seasons' of Nibiru, with respect to its relative proximity to the Sun, fall way short of the mark. Nibiru's closest approach to the Sun is too short, and too distant to have any seasonal impact at all...if Nibiru is simply a terrestrial planet following a long-period comet path, that is. For 99.9% of its orbit Nibiru would be absolutely frozen solid, down to the most volatile of its atmospheric gases. Sitchin seems to reject my notion of a sub-brown dwarf and warmed moons, which is a pity. Sitchin concentrates mostly on the mythology of the Anunnaki, and the complex relationships between them, and us. His account of the artificial creation of humans is excellent in this book, giving a much more dramatic treatment of this subject than before. His writing reflects the incredible complexity of the ancient Mesopotamian myths, and underlines how facile it is to seek to explain them simply in terms of weather gods and the like. He also rethinks the nature of the 'Igigi', and creates a new scenario for the Face on Mars. Would I recommend this book? Not as readily as some of his others that seek to apply more rigorous analysis to actual ancient texts. 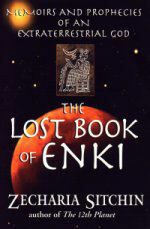 ‘The Lost Book of Enki’ is written as though it was a classic, but it is unlikely to become one. But if you enjoy reading Homer, or the Epic of Gilgamesh, this book may well appeal to you.